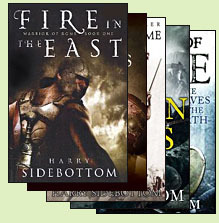 The "Warrior of Rome" series by Harry Sidebottom is set in an age when the Roman Empire came very close to falling, a good century-and-a-half before the final reckoning actually arrived. The Empire's great crisis in the last half of the third century featured events in the east no less dramatic than the rebellions and invasions that plagued the west. A revived Persian empire assaulted the eastern frontier; in the wake of their early success, another power arose at Palmyra. Meanwhile Goths began to raid from the Black Sea. Classical scholar Sidebottom has undertaken the task of transforming these events into historical fiction. He is, as it happens, a great fan of the genre, one who has learned his craft from close observation of its masters, and he pays tribute to a couple of them at the end of each novel. So it's no surprise that his "Warrior of Rome" series, which reached five volumes in 2012, succeeds brilliantly in transforming the tumult of a little-known age into riveting entertainment. Sidebottom's protagonist is a former hostage from an obscure Northern tribe. He is drawn into an assassination plot in the first pages of Fire in the East, is rewarded with a high military rank, and earns the nickname Ballista. His non-Roman background makes Ballista a perpetual outsider, the sort who makes new enemies every time he turns around. It took me a while to notice the sly tribute underlying one particular detail: this misfit military hero is an Angle, and the sidekick who fights along his side is from Hibernia, which is to say, Ireland. At the end of King of Kings Sidebottom mentions his fondness for the writing of Bernard Cornwall, who wrote a great many novels about an English officer from the wrong side of the tracks named Sharpe, and whose battle companion is a powerful Irishman named Harper. Sidebottom's novels are sprinkled with these subtle homages. They are also researched with a thoroughness that puts most competitors to shame.